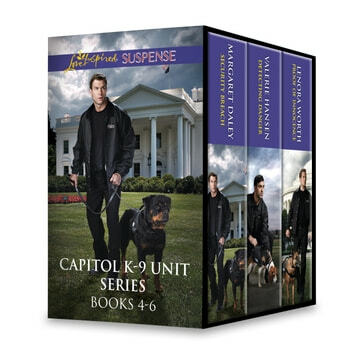 Love Inspired Suspense fan favorites Margaret Daley, Valerie Hansen and Lenora Worth bring stories of danger and intrigue from the Capitol K-9 Unit series. Relish these three exciting romantic suspense novels in one box set! When the White House tour director is attacked in her office, she’ll have to depend on a Capitol K-9 Unit officer and his Rottweiler partner to unravel the mystery of who wants her dead. An explosion at the Washington Monument leads a Capitol K-9 Unit officer and his bomb sniffing beagle to a nurse with a dangerous past. Can he save her when it’s her own criminal father who wants revenge on her for sending him to prison? A K-9 unit officer has been searching for his ex-girlfriend since she went on the run as a person of interest in a murder case. Now that he’s found her, he vows to keep her alive…and to clear her name.